This post contains affiliate links and is sponsored by Autumn McKay. All thoughts and opinions are my own. Please view my disclosure for more info. The eyes of a young child when they learn something new is fantastic to see. Teaching letters to kids is so fun! 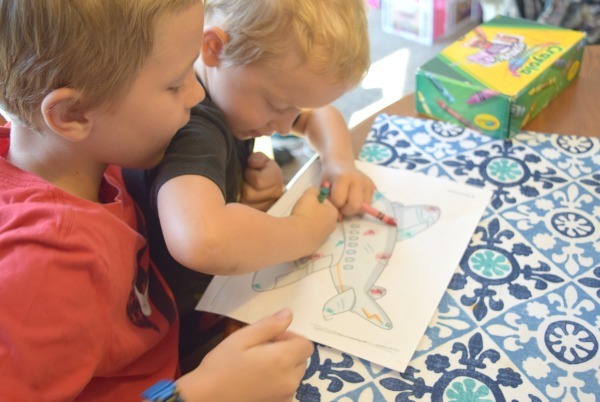 With developmentally appropriate activities for their age group it’s an enriching way to add some focused activity time into the day. There is nothing better than toddlers and preschoolers exploring in positive ways. We all know (moms who have had toddlers) that often a child’s explorations lead to some negatives like marker on the walls or a trash bin dumped on the floor. Teaching letters is a fun way to explore learning with your 2-4 year old. It is easy when you have a guide or lesson plan book to go to with great ideas of simple activities. If you didn’t catch my previous post on lesson plans for teaching colors or the color activities on my toddler activities page, those are great resources too. 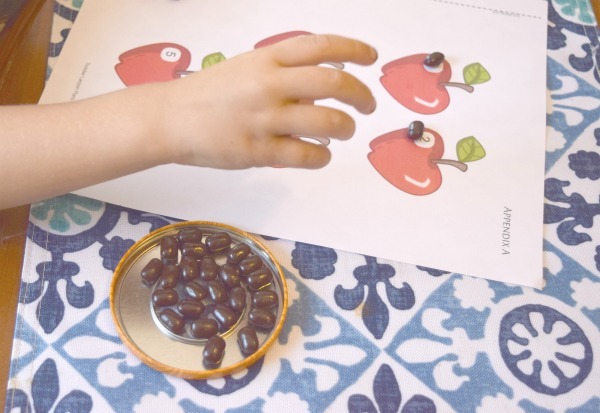 How can you teach toddlers colors in an age-appropriate way? 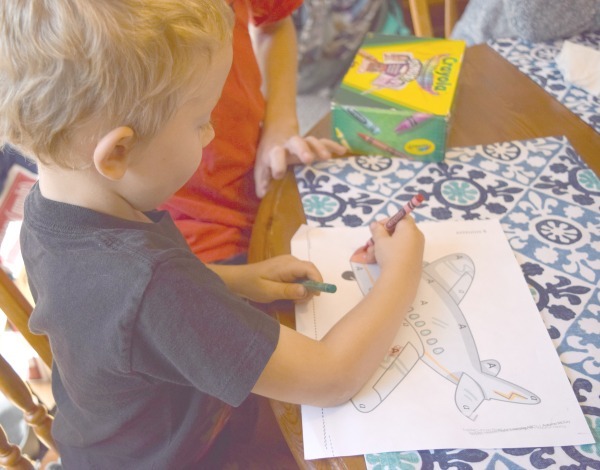 Autumn McKay, mom to 2, has put together a fantastic resource for those of us looking to teach our toddlers some fun learning activities while staying within their level of understanding. She wrote the book, Toddler Lesson Plans: Learning ABCs after doing the included activities with her own children. This guide has a straight forward process and simple, engaging activities for preschool kids. I like to teach them how to sit at the table to learn, in small moments. This way they learn each time we do an activity that sitting and focusing is important, but they don’t have to sit for long periods of time at home. 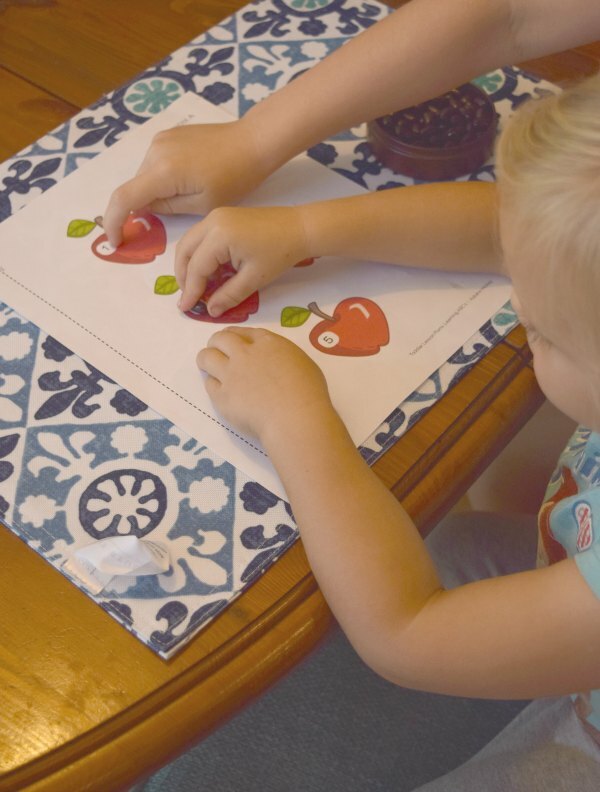 The activities for toddlers in Toddler Lesson Plans: Learning ABCs are perfect for children who want to sit and learn for a while, or those who can only sit and learn for a few minutes. My twins easily sat for two activities, but the lesson plans are written for one activity per day. You can print out a few activities and start with one a day-or try a couple here and there-to expose your child to great letter learning activities easily. 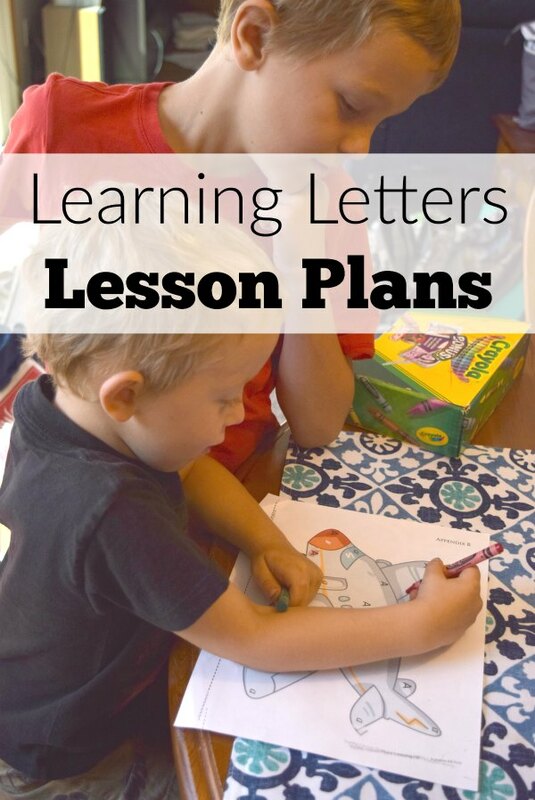 There is a weekly lesson plan for teaching letters. You can work it in to your daily schedule if you are using the Daily Checklist for Moms. 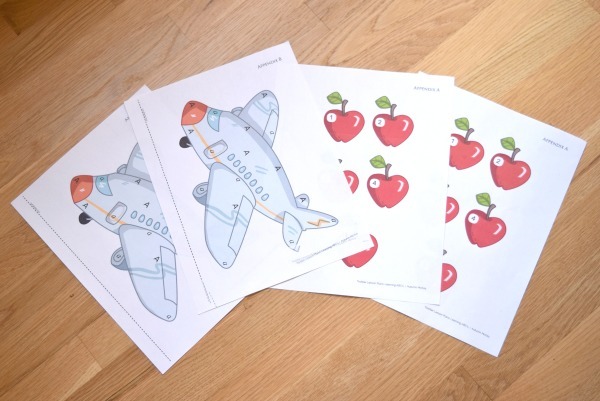 My twins and I started with the lesson plan and activities for learning letter a. I printed out two copies of the A airplane and the apple seed counting pintables. These would be good activities for a playdate or preschool homeschool co-op. My preschoolers wanted to do the apple seed counting activity first. I set some black beans in little tins and shared the simple directions. The goal was to count out the number of beans listed on each apple. Learning letters was combined with a little preschool math. Big brother and big sister were right there to help, so I had my trusted homeschool preschool assistants! I love that they like to help their little brother and sister learn. I even made reading to their younger siblings part of their required homeschool work each day. (Then I get a little moment to collect my thoughts each day too!) All the kids enjoy this time. 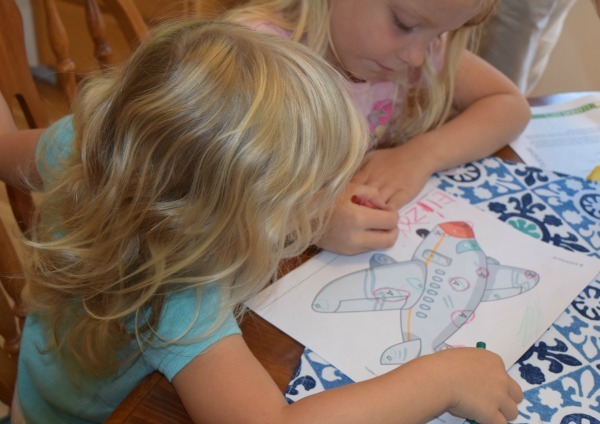 Since the twins were showing me that they could handle more sitting time and more activity time, we moved on to the Airplane letter activity. 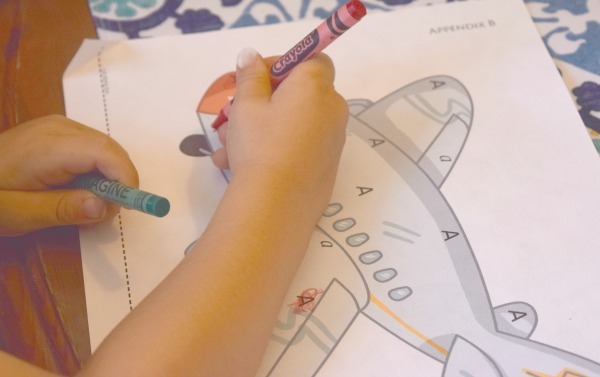 The objective of this activity was to use one color crayon to circle or mark the upper case A, and a second color crayon to mark or circle the lower case a wherever they are found on the airplane. Having twins makes seeing the differences in how two children at the exact same age can learn and achieve differently. It’s always interesting to see which activities my twin son excels at and which my twin daughter does well. Big brother and sister were close by (literally) again to help out. The younger two really feel important when the older two spend focused time on them like this. 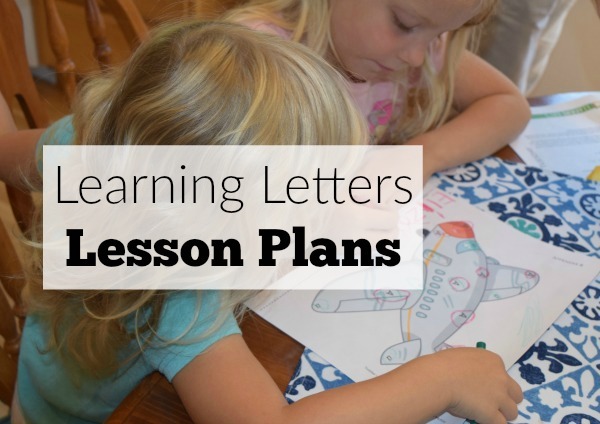 Lesson plans for learning letters make it that much easier to use your time at home with your children to do focused learning activities. 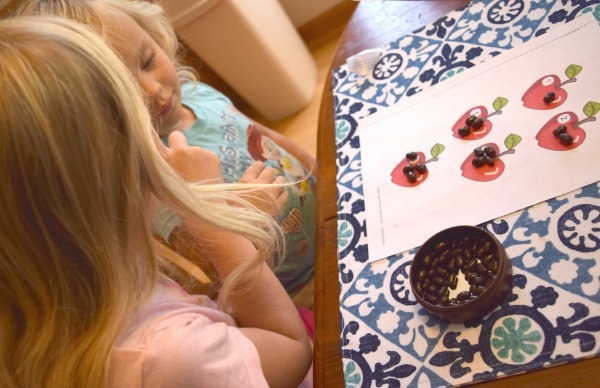 We will be using these activities as part of our homeschool preschool learning. Get your copy of Autumn’s book on Amazon and check out her website with great ideas for moms, Best Mom Ideas. Both are great resources for making the most of your time with your kids.